Although fire has reduced most of the landmarks of the village, one of the few still standing is Aberfoyle Mills. It was built George McLean, probably in 1862, the same year as the other McLean opened his grocery store across the road. At one time, four stones were turning, according to Mr. Mahon, two for oatmeal, one for flour and another for feed. "Annals of Puslinch 1850-1950 states that in 1829, Patrick Mahon, a native of County Mayo, Ireland, arrived in Canada. After spending some time in Lower Canada, he travelled via Dundas and Galt to Guelph. A slightly different version appears in the 1906 Historical Atlas of Wellington County". It says that two brothers, Patrick and Dominick Mahon, journeyed to the new world in 1831, stopping a few months in Toronto, then continuing to Puslinch. At any rate, Patrick Mahon 1791-1872, his wife, Barbara A. (Burke) and his brother Dominick (born about 1795, came to Puslinch around 1830. They were considering settling on land in the vicinity of what is now the University of Guelph, when Patrick, previously a miller in Ireland, learned of the possibility of developing water power at Aberfoyle. He took possession of lot 21 and 22 C.8 Front, Puslinch, and built the dam which flooded 15 acres. He planned to construct a mill but apparently decided that the water power was insufficient. Once the clearing and draining of swamps began, the volume of water in rivers and creeks diminished substantially and this may have caused him to abandon his project. Shatz was hampered by insufficient power due to the limited access he had been allowed by Mahon. He initiated a lawsuit against Mahon to remedy this, and it was not settled when he died. Executors of the Shatz estate agreed to sell him the property, conditional upon the Government cancelling the sale of that portion of Mahon's claim necessary for the construction of a dam. David Stirton M.P.P. took up the issue with Crown Lands on their behalf, and was instrumental in having the entre 27-acre mill privilege transferred to the estate. It appears that Patrick Mahon did not trouble to register his title to the land until this decision was made. Crown grants were issued to George McLean on May 8, 1863 and to Patrick Mahon on May 13, 1865. Patrick and Barbara Mahon remained on the land at Aberfoyle all of their lives. Their children were John, Mary, Annie, James, Mrs. John Foster, Barbara and Peter (1840-1895. Peter succeeded them on the property and also purchased another 250 acres (Lots 19 and 20, c.9). One hundred years later a descendant, Thomas J. Mahon, wrote the Aberfoyle section of the Annals. George McLean was born in the highlands of Scotland on May 31, 1827. In 1831,his elder brother Donald and 5 other natives of Badenoch Invernesshire, sailed for Canada. In 1833, his parents, Peter and Margaret Martin McLean and their 9 other children emigrated to Badenoch in Puslinch. Donald McLean chose lot 31 rear 9 for his brother George, but George never wanted to farm and eventually the property was transferred to their sister, Margaret, Mrs. James Hanning. Lumber was plentiful in this region, particularly virgin pine. George McLean and his friend Peter Clark were saw millers. In 1850 they owned lot 5 c13 East Flamborough. On Nov. 10,1855 George McLean and Peter Clark bought two and one half acres, part of lot 32 c8 front. This property was on the east side of the Brock Road at the southern end of Morriston. In 1856 they erected a house, sawmill and shortly thereafter an oatmeal and grist mill which they called "Puslinch Mills." The 1861 census shows that the mill was steam-powered. It employed 5 men at $85/year. Employed were: John Little, Michael Martin, George Logan and Nancy Morrison On the premises were 2000 pine and oak logs. One year's production of 500,000 logs was valued at $6,350. In 1861 this mill burned down and was not replaced. Four run of stones were installed, two of these for oatmeal, one for flour, and the fourth for chopping feed for the farmers. The business soon grew to be a prosperous one, twelve to fifteen men being employed. five teams were on the road constantly, some drawing oatmeal to Guelph for rail shipment or for local use, and some travelling to Hamilton with flour and oatmeal. The return loads from the latter place were usually groceries or other freight for storekeepers along the road. From Guelph large quantities of oats were brought, some bought from grain buyers here, and some from outside points, that had been shipped in. James Little, who had been Mr. McLean's miller at Morriston, came with him to Aberfoyle. After his mill at Morriston was burnt, George McLean moved to Aberfoyle and bought a property on which a steam sawmill owned by a Mr. Fraser already stood. Here he built a mill of brick for the manufacture of both flour and oatmeal. He put up a dam and dug out raceways to make use of the flow of two or three creeks which ran through his land. A kiln for drying the oats was also built, separate from the main mill, constructed that imposing two and half storey building from brick made in the Morriston brickyard. He called this the "Puslinch Mills" also. The staple of the Canadian economy when the township was a pioneer district 130 years ago was wheat. Farmers sold the surplus and drew some home for their own needs. Oats was quite important to those of Scottish origin. According to Mr. Thomas Mahon, the Aberfoyle Mill once had four run of grindstones turning. (Two stones were a run.) Two runs ground oatmeal, one ground flour and another, feed. A LeFell vertical turbine turned the millstones from a 600-foot sluiceway. In 1867, oatmeal from the mill was sent to the International Exhibition (the world's fair in Paris, France) and was awarded first prize, a gold medal and diploma, in a show open to world competition. Twelve to fifteen men were employed at a time. Some of these men were: James Little, Peter Clark (who became known a "Peter the Miller" and Gregor McGregor. Peter the Miller was not the aforementioned Peter Clark, but his nephew who later lived at Moffat. Five teams of horses were on the road picking up grain and delivering flour, oatmeal and chop. Mr. Little, like all millers who used good wheat and took great pains in the making of flour, had little patience with complaints about the quality of it. One day an irate farmer came to the mill with a bag of flour, declaring that it was utterly unfit for baking into bread, and asking that it be changed for a better article. Mr. Little indignantly refused to do sny such thing. Mr. McLean, who was standing by , said to him: "Jimmie, you had better do as he wishes". But Mr. Little more firmly declined, saying: "I'll no change it for you, Mac, or ony ither mon." McLean then told the farmer to take a walk up to the village and come back and the matter would be attended to. When the farmer returned the flour had been changed, but the only change made was in moving the bag from one side of the door to the other. In a few days, the farmer appeared at the mill again with a happier countenance declaring that the changed flour was most excellent, the bread superb and that if he would only be more careful and make flour like that always, there would never be any further trouble. George McLean married Ann Kennedy (born about 1836), the daughter of Robert and Penelope McPherson Kennedy. According to the records of Duff's Church, George and Ann had a family of 6 children: Peter Clark 1857, Donald George 1859, Margaret Ann 1861, Alexander James 1864, George John 1867, and Penelope Grace 1860. More offspring may have been born after the family left the vicinity. Fire destroyed the mill in 1866 but, still undismayed, he quickly rebuilt. He did not install any oatmeal machinery, but confined the mill to making flour only. Having a fine oatmeal trade, he wanted to retain it, but Aberfoyle was unsuitable for such a business. Not enough oats came from local farmers to keep his mill fully employed. Teaming expenses between Guelph and Aberfoyle brought the cost up too high, so he decided to start up in Guelph. In September 1869, he leased from Peter Gow for ten years a vacant building formerly occupied by a woolen manufacturer. This lease included the water privilege. McLean fitted it up for the manufacture of pot and pearl barley, cornmeal and oatmeal. Four run of stones for the meal and one special barley mill were used. Since his oatmeal had won the gold medal and diploma at Paris in 1867, it was in great demand, much of it going to the United States. He called his plant "Puslinch Mills," and his meal bore the same name on the packages. His miller used the best white oats for the meal that won in France and continued to use the same for U.S. shipments. When the oats were being kiln dried, sulphur was put on the fire to improve the color of the finished article. The firm of John F. Tyrell, of New York, handled all the oatmeal that was sent over the border, and as they required much of it put up in one pound packages, the firm of Davis and Murton took the contract for doing the packing. In their facility, 125 girls were employed to put up the oatmeal in strong paper bags, holding one pound each. Oatmeal was teamed up every day from the mill to this packing plant. The pound packages were next put into boxes of three sizes, holding 10, 20, and 50 one pound bags each. The boxes made by Robert Stewart were models of joiner work, and attractively stencilled on four sides. In 1872, George McLean gave up the business. Harry Murton took over the lease and ran the business until the winter of 1881-82 when the career of the cereal mill came to an end. At the Aberfoyle location, he carried on here for some three or four years, and then sold out to William McDonald and Co. Mr. McDonald had been in the sawmill business previously. As the water supply was failing they put in steam power, to help out. The small building on the north side housed the steam boiler. The mill heretofore was using stone, but to keep up with the age, the roller system was adopted. Gregor and Elizabeth McGregor and their two sons, John and Andrew emigrated from Inverness to Aberfoyle in 1869 or 1870. Gregor worked at the mill. When George McLean sold the mill to William McDonald on Feb 25, 1875 and started up the "Puslinch Mills" near the junction of Water and Wellington Streets in Guelph, Gregor moved to Guelph also. The Guelph city Directory of 1882-83 described the location of the "Puslinch Mills" as on Water St. near the Dundas Road and as on Wellington street at the Speed River. This mill was purchased from George McLean by Henry Murton for whom McGregor worked for 20 years. It was finally torn down. About 1896, Mr. Day retired and Mr. Hammersley became once more the sole owner, but only until the end of 1912, when he disposed of it. William McDonald leased the Aberfoyle Mill to the Houston (or Howson) brothers and the Nicolls for a short period during which it ran continuously day and night. Since the water supply was failing, they installed steam power. On March 3, 1885, R.B. Morrison bought it and placed his son Charles in charge of the business. March 18, 1889 R.B. Morrison sold to John Hammersley John Hammersley 1832-1908) farmed on lot 17, c.8 where he was born on Christmas Day 1832. He is said to have been the first male child born in Puslinch. He married Emma Bullock 1842-1913 and they had two children, Herbert 1865-1929 and Mrs. Henry Brown. Around 1892, Thomas Day came into partnership with John Hammersley, and about 1896 John's son Herbert, became involved in the business. At this time, a roller system was adopted to replace the stone grinding wheels. One of the most exciting incidents in the history of Aberfoyle occurred either during the partnership of Day and Hammersley or shortly after. Mr. Thomas Mahon described it for a Mercury article Dec. 3, 1953: "It must have been some time during World War I. I was with a threshing crew on the Black farm about 150 yards from the mill when there was a terrific explosion and the roof blew off part of the mill. A great cloud of dust and steam shot up in the air and part of the roof was blown through the stable across the road. The steam boiler had blown up; luckily no one was hurt. But there wasn't much work done for the rest of the day". Thomas Day was a practical miller and retired c 1896. Herbert Hammersley married Margaret McLean 1867-1944, daughter of James McLean, Aberfoyle store keeper and for many years, township clerk. Their children were Emma 1890-1974, of Guelph; Mary called Mae 1892-1968 of Guelph, Alfred 1892-1967 of Saskatoon; and Christina, Mrs. R. Gordon Jamieson of Kirkwall. Miss Mae was an employee of Doughy-McFarlane Co. in Guelph for 30 years. The mill pond played an important role in the social life of the village. Harold Bell recalled Aberfoyle was also know as "Frog Town". After the dam was built at the Mill, a powerful chorus of bull frogs moved into the pond. Their nightly singing could be heard through the village, and Harold speculates that this is how the name came about. Harold recalls a neighbour reciting a lengthy poem entitled "Frog Town " to him when he was a youngster, but he can only remember the first two lines. " Harold told of skating on the dam at Aberfoyle. He used spring skates that fitted right onto his shoes. But the trouble with skating was that the snow had to be shovelled off first!
" With an agreement signed on Aug. 1 1908, Herbert Hammersley granted fishing privileges to William A and George W. Clark, trustees of the "Good Times Fishing club" a group of Guelph and Toronto business. They operated a small lodge on an island in the mill-pond until World War II. Thomas Mahon recalled catching a dozen trout in less that an hour when he fished in the pond as a youngster. Nov. 14, 1912, Herbert Hammersley sold to Gilbert MacEachern. Aberfoyle Realty bought it from him Aug. 13, 1913 and sold it to James F. Murphy of Freelton June 5, 1915. Jim Murphy from Hespeler began under lease with the Fishing Club in 1912-13 did not grind any flour but sold flour and prepared feeds and did chopping for farmers. He installed hydro in the mill in 1925. Wilfrid Jay worked for him. Jim Murphy would frequently give children who accompanied their father to the mill a penny to spend at the McLean store. Jim and Mary (Quirk)Murphy had one daughter, Miss LenoreMurphy d. 1983. She taught piano lessons and was in charge of the Aberfoyle Post Office 1965-1969-12-04 when post office was permanently closed. Following Jim Murphy's death in 1948, Mrs.Murphy sold the mill to S. Eugene Griffin who did business at the mill until 1952. Then it lay idle, falling into disrepair. 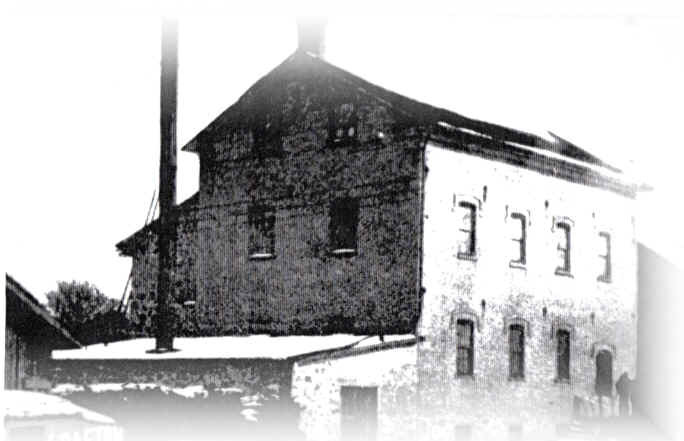 June 14, 1960, the Mill began a new existence when it was purchased by Stanley and Marion Owens. Through the genius and foresight of Mrs. Owens and as a result of six years of work, the Aberfoyle Mill was not only preserved as a historic site but attained distinction as a fine restaurant. Marion Owens came to Canada from England in 1947. She had been born to an artistic family . Her grandfather, a noted sculptor, designed the cenotaph at Whitehall. She was one of the ten women decorated with the Order of the British Empire for bravery in the Battle of Britain. She was the driver for the London fire chief during the bombing and was accorded the medal for closing a fire door during a raid on the Woolwich arsenal, one of the largest ammunition dumps in England. In Toronto, she owned the Avenue Shop, an antique store which attracted customers from far and wide. When that building was demolished by developers, the Owens moved to "Sarasota Farm" on Concession 7, Puslinch, near Guelph, where they also sold antiques. In 1960, they set about restoring the mill as nearly as possible to its original condition. The turbine, the machinery and the sluice runway were repaired. In the main dining room, a large Credit Valley cut stone fireplace, which weighed nearly twenty seven tons was constructed. The decor was made up entirely of authentic antiques constituting the country's largest personal collection of Canadiana. Hung from the ceiling and on the surrounding walls were more than a hundred individual household articles and agricultural implements from earlier: a single cutter, a blacksmith's bellows, firearms, rakes, flails, scythes, kegs, casks, ukets, spinning flax wheels, shovels, a sausage-maker, old bottles and plates, harness, etc. The second floor and the basement, where the turbine could be viewed, were reserved for private parties and meetings. The upper storey was used for art shows and cultural activities. The grounds around the mill were landscaped, thus turning a cedar swamp into a park. For a year or so, this park was open for public swimming. The Owens also started the "Aberfoyle Flea Market" renowned antique fair. After some time, their sons, Howard Fryer and Peter Owens, took over the flea market and moved it across Highway 6. Oct. 26 1973, Marion and Stanley Owens sold to Bill-lyn Co. Ltd. Both have since died. Howard Fryer operates a restaurant in Mexico and Peter Owens, resident in Aberfoyle, is a balloonist and runs Aeroblim Co. The mill is widely acclaimed for its excellent cuisine and striking decor. Among its patrons is an international celebrity, singer Tom Jones, who dines where when appearing a nearby cities. The History of Aberfoyle Mill was written in "Puslinch Past& a few years ago by Marjorie Clark. "Pioneer Days in Wellington County", a series of articles published in the Guelph Mercury in 1899, based on the memories of David Stirton, 1816-1908 contains facts not reported elsewhere. The Centennial Edition of the Guelph Mercury contains details about Puslinch Mills in Guelph. This grist mill provided employment right up the 50's when it operated with steam power, using more than 100 tons of coal per year and a great many cords of wood.